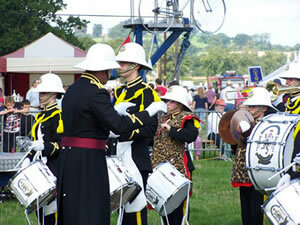 It is the leading agricultural event in Gloucestershire and one of the best shows on the circuit. There are no permanent show buildings and the Show is built-up in the traditional way with marquees and hurdle pens giving it a true country show atmosphere. The 2007 Show will be held on Saturday 1st September with Horses, Poultry, Home and Garden, Trade Stands and a full day's entertainment but, sadly, with no cattle, sheep, goats, pigs, llamas or alpacas. This year, in addition to all the usual attractions, the Show will also contain a World Record attempt for The Largest Morris Dance, which will be held at 1.00 pm in the Grand Ring. The show starts at 10.30 am and finishes at 18.00 pm. Put the date in your diary and get along to Moreton - you will enjoy the day out.